A military dog who lost her leg on duty in Afghanistan has received a vet charity’s medal honouring the work of animals in war. Lucca, a 12-year-old German Shepherd, suffered injuries including the loss of a leg during a search for improvised explosive devices (IEDs) in 2012. She received the medal at a ceremony at Wellington Barracks in central London. 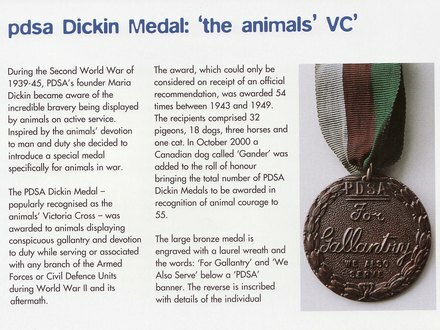 The Dickin medal, founded in 1943, is awarded by the People’s Dispensary for Sick Animals (PDSA) charity. Lucca was trained by US Marine Corps as a search dog to sniff out munitions and explosives, and according to the Marines, protected the lives of thousands of allied troops. On her final patrol Lucca discovered a 30lb (13.6kg) IED and, as she searched for additional explosives, a second device detonated. A U.S. Navy dog handler at the War Dog Memorial in the National War Dog Cemetery at Naval Base Guam. 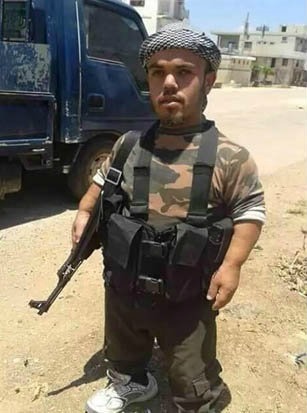 Military animals are domestic animals that are used in warfare and other combat related activities. As working animals , military animals serve a variety of functions. Dogs , pigs , oxen , camels , horses and other animals are sometimes used for transportation and bomb detection. Elephants , pigeons and rats are also used during wartime, while dolphins , and sea lions are in active use. 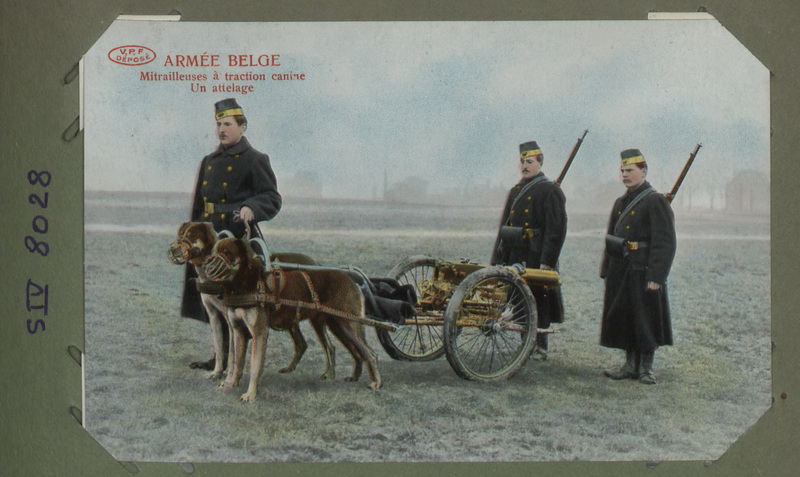 This is a casualty dog – they were trained to find wounded or dying soldiers on the battlefield. They carried medical equipment so an injured soldier could treat himself and they would also stay beside a dying soldier to keep him company. A German war dog, fitted with apparatus for laying telephone wires, walking across muddy ground, 1917. A dog handler of the Royal Engineers (Signals) reads a message brought to him by a messenger dog, France, 19 May 1918. Togo, the cat mascot of the battleship HMS Dreadnought. 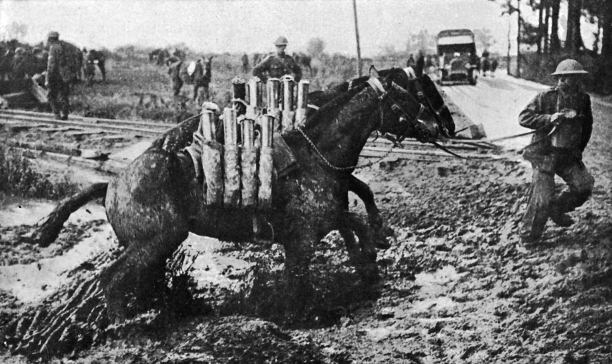 A pack horse with a gas mask is loaded up with equipment during the Battle of Pilckem Ridge, Belgium, 31 July 1917. Homing pigeons have long played an important role in war. Due to their homing ability, speed, and altitude, they were often used as military messengers. Carrier pigeons of the racing home breed were used to carry messages in World War I and World War II, and 32 such pigeons were presented with the Dickin Medal. They ceased being used as of 1957. 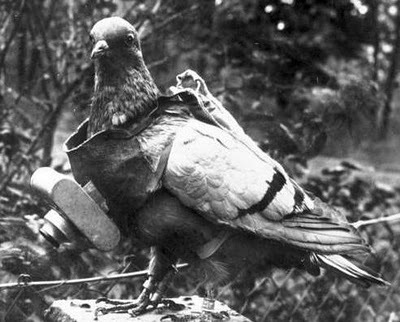 During the First and Second World Wars, carrier pigeons were used to transport messages back to their home coop behind the lines. When they landed, wires in the coop would sound a bell or buzzer and a soldier of the Signal Corps would know a message had arrived. He would go to the coop, remove the message from the canister, and send it to its destination by telegraph, field phone, or personal messenger. 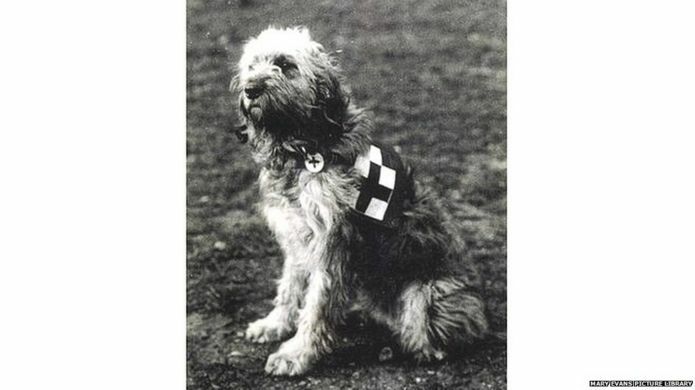 There are many stories of animals who became companions to soldiers during World War One. 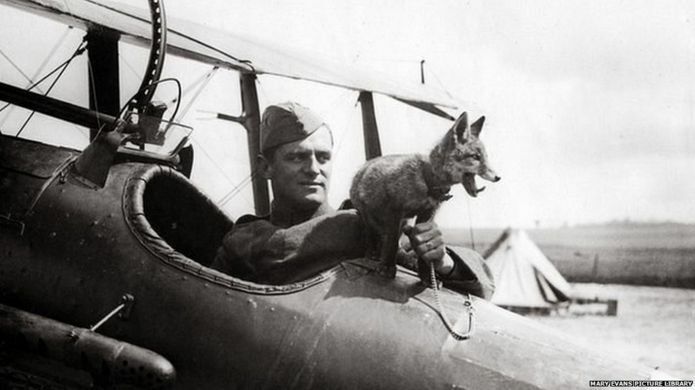 Here is an RAF fox mascot sitting on a plane with the pilot during World War One. 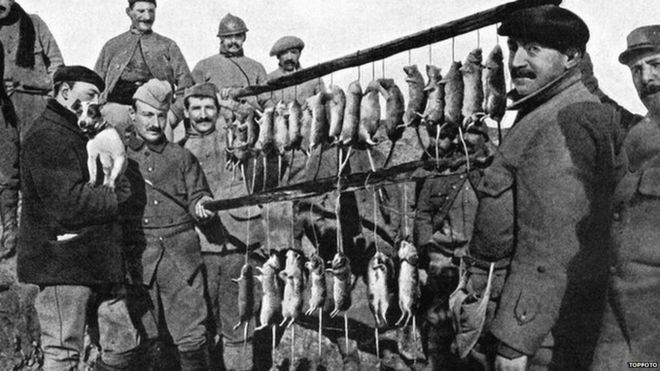 Soldiers living in trenches encountered millions of pests during the war including rats. They fed on rotting food because there was no proper way of getting rid of rubbish in the trenches. A little terrier dog shows off its catch after a 15 minute rat hunt in French trenches in September 1916. French Red Cross dogs line up for inspection on the Western Front, 1914. The war elephant’s main use was to charge the enemy, breaking their ranks and instilling terror. 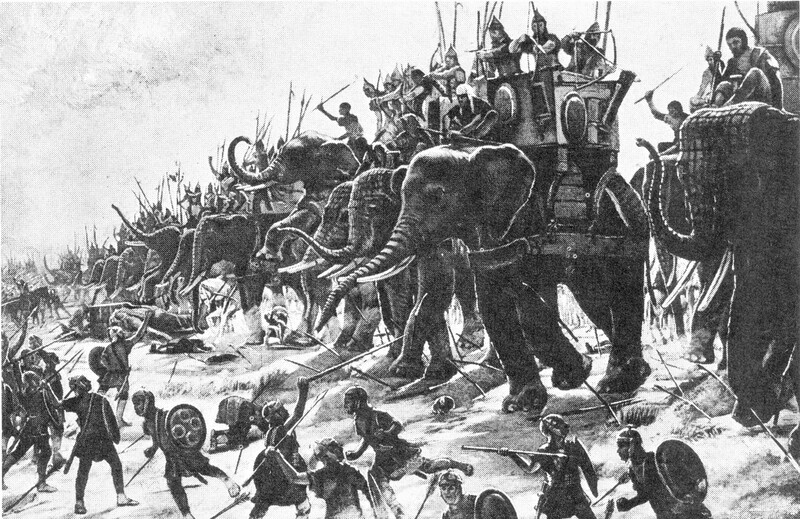 Elephantry are military units with elephant-mounted troops. They were first employed in India, the practice spreading out across south-east Asia and westwards into the Mediterranean. Their most famous use in the West was by the Greek King Pyrrhus of Epirus and in significant numbers by the armies of Carthage, including briefly by Hannibal.